This is my new hymenocallis, Sulpher Queen. 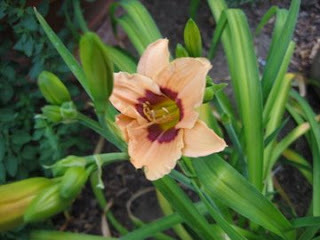 I am really liking them although the first two buds on a different plant were enjoyed by earwigs before opening. This one looks much better! Not as tall as the old common peruvian daffodil I've had for years...or maybe it's because it's the first year? 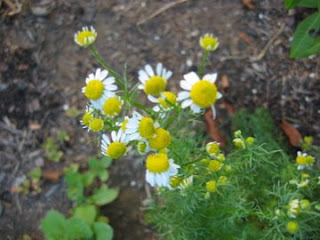 Chamomile that I'm hoping to dry for tea...if I figure out the process soon! Blue agapanthus...the white is about a week or more behind the blue. I guess I'll have to pay attention and see if that is always true. We like these strong tall stems because we often get garden spider webs from one to another...and they're in the perfect spot for observing! 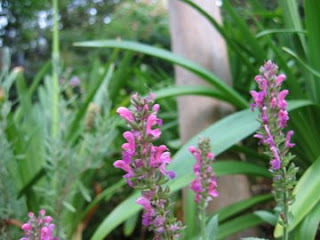 Salvia nemorosa Friesland Pink...much pinker than any other of my salvias...makes a nice contrast to all the blue/purple. 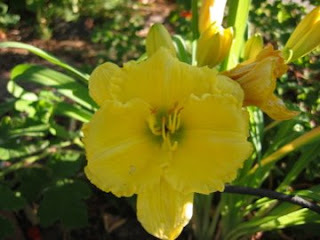 Hemerocallis...hmmm... can't find name tag under plant and I don't remember it! 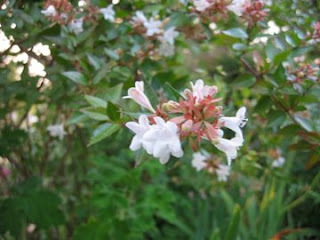 Glossy abelia Edward Goucher. Cute tiny trumpet-shaped flowers. 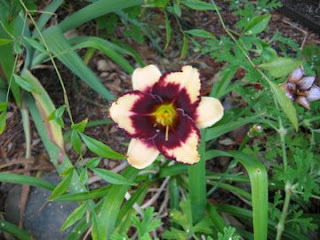 Another hemerocallis...could this be Judith? OK...this one is Siloam Spizz! See...yellow in my garden! This is actually in bud...my last year's experiment that barely grew is much happier this year! Any guesses? Well...it's not an artichoke. This is cardoon. I was very excited to get seeds and start a plant last year, having heard that the stems are the edible part of the plant and that they tasted like artichoke. Yum! And I got tired years ago of earwigs in home grown artichokes so I quit growing them. But the poor thing had no stems to spare last year. Now I'm torn between eating some of this and letting the plants go to seed so I get a few more plants. I'm a bit apprehensive, too, since I've heard it really likes to reseed in a borderline invasive way. And...it's not a small plant. I think I will let it reseed, try cooking some and if it proves worthy allow it to occupy a bigger spot next year! Wow! You've got tons of stuff in bloom right now. Looks lovely. My favorite, though, has to be that hymenocallis. What a beauty! Your pretty Hymenocallis caught my eye too - a friend had Peruvian Daffodil, giving me the idea of trying them. Leslie, your bloom list is enormous and it's always fun to see what we have in common- earlier this spring I added an abelia Edward Goucher to the Pink Entrance Garden. 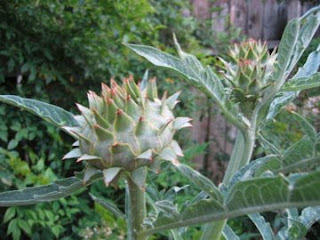 Let us know if you sacrifice some of the cardoon for the dinner table! I've never seen a Hymenocallis before - what a beauty! Your list of plants is impressive! You surely have the longest list of blooms for bloom day that I've seen so far, and I've seen a lot. I also like that first bloom, the hymenocallis. Hi MSS...this is prime bloom time although we are lucky to have a long season. The hymenocallis is from Brent and Becky's...so many bloggers order from them I had to try a few things! I think you'll like your abelia, Annie! It blooms here for months and if you don't prune it into a block, like I've seen so many people do, it has a really lovely arching form. I'm not surprised you like the cardoon, Kim! I wonder if you could grow one? They have one in the Cloister's garden in New York City...it"s a fairly protected spot...you could arrange that couldn't you?? Hello Katarina! 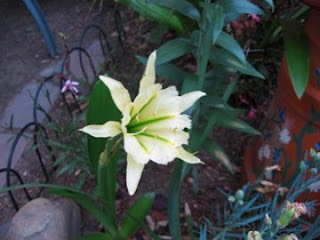 The hymenocallis is the first of my Brent and Becky's bulbs to bloom...I'm hoping the lilies are are successful! Poor Carol! I hope you don't feel too required to view each post too soon after bloom day...this month has to be a record! I love that there are so many bloggers I've never even heard of! You are truly the garden blogger rock star! I agree with the first comment. I love the hymenocallis. But, everything looked so beautiful and fresh. hymenocallis - that is a new one for me. 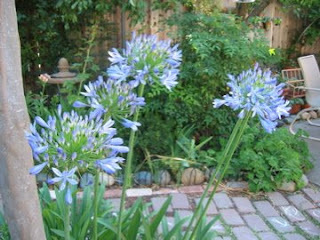 Love the agapanthus, my California raised husband keeps bringing some back to Utah in pots, and trying to overwinter it. Pretty blooms! I love how the Agapanthus looks against the brick walk.